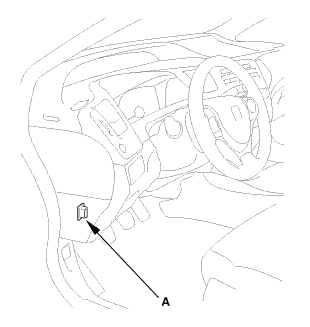 From under the front passenger's seat, disconnect the front passenger's weight sensor connector A, B and C.
Remove the front passenger's weight sensor unit (D) from the bracket (E). NOTE: While separating the front passenger's weight sensor unit from the bracket, use a flat-tipped screwdriver (F) to push and release it from the bracket. 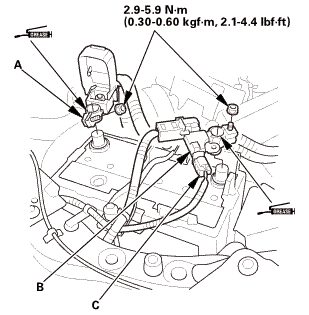 After replacing the front passenger's weight sensor unit with a new one, initialize the front passenger's weight sensor unit. Front passenger's weight sensor unit initialization initializes the front passenger's weight sensor. After installing the front passenger's weight sensor unit, make sure the front passenger's weight sensor unit has the latest software. If it does not have the latest, update the software in the front passenger's weight sensor unit. 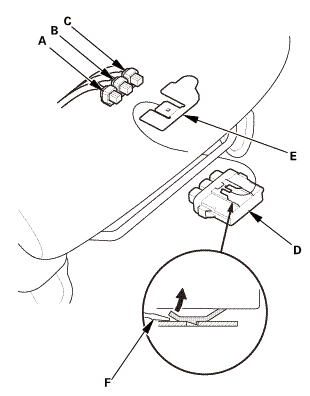 Install the front passenger's weight sensor unit (D) to the bracket (E). NOTE: Make sure the front passenger's weight sensor unit is properly installed. 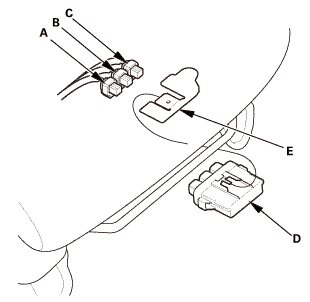 You will hear a click when the front passenger's weight sensor unit is securely mounted on the bracket. 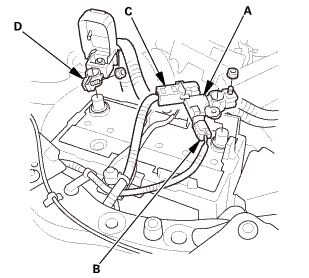 Connect the front passenger's weight sensor connector A, B, and C.
Make sure the HDS or the MVCI unit has the latest HDS software version. Before you update the front passenger's weight sensor unit, make sure the battery in the vehicle is fully charged, and connect a jumper battery (not a battery charger) to maintain system voltage. Never turn the ignition switch during the update. If there is a problem with the update, keep the ignition switch ON (II). To prevent front passenger's weight sensor unit damage, do not operate anything electrical (headlights, audio system, brakes, A/C, power windows, door locks, etc.) during the update. To ensure the latest program is installed, do a front passenger's weight sensor unit update whenever the front passenger's weight sensor unit is substituted or replaced. You cannot update the front passenger's weight sensor unit with the program it already has. It will only accept a new program. If you need to diagnose the MVCI unit because any error message is indicated on the MVCI unit display during the update, keep the ignition switch ON (II) when you disconnect the MVCI unit from the DLC. This will prevent front passenger's weight sensor unit damage. Exit HDS diagnostic system, then select the update mode, and follow the screen prompts to update the front passenger's weight sensor unit. If the software in the front passenger's weight sensor unit is the latest, disconnect the updating tool from the DLC, and go back to the procedure that you were doing. If the software in the front passenger's weight sensor unit is not the latest, follow the instructions on the screen. Keep the ignition switch ON (II).